Under the premise of transformation and upgrading, the vast majority of Chinese fastener companies must face such a situation: the rise in raw material prices, the appreciation of the renminbi, and rising labor costs. The rise in raw material costs has caused companies to increase product prices, but the premise of product price increases is the increase in technology and brand strength. This is a continuous process. This is a bottleneck for small and medium-sized fastener companies. They need to survive hard. Looking back at the course of development of the fastener industry in the past, it is not difficult to find that the saturation of the product will inevitably occur whenever the market is booming. China's fastener production accounts for a quarter of global production, but most of them are low-intensity and low-grade products, among which standard items below 8.8 account for about 45%-50%, in an environment where raw material prices are high, The overcapacity of low-grade standard parts has become a stumbling block to the development of the entire fastener industry. Overcapacity, a large amount of inventory pressure leading to tight operating funds, companies want to convert costs into profits have to find new ways, increase investment in technology, with good technology in order to open up broader market resources. In Luo Baihuiâ€™s view, we should look to the future. Key national construction projects such as â€œhigh-speed rail,â€ â€œaerospace,â€ â€œhighways,â€ â€œairports,â€ etc. are providing opportunities for tight-to-high-end enterprises. Boeing plans to add 3,400 planes to the country in the next 20 countries. The NDRC has invested 800 billion yuan to build rail transit in 6 cities. According to 36 plans to build urban rail transit project cities, by 2020, the new operating mileage of urban rail transit will reach 6560 kilometers, and the demand for rail fasteners will reach 55- 7 billion yuan. These large-scale projects will greatly increase the demand for high-strength fasteners such as high-strength fasteners and titanium alloys. It is not impossible to remove the â€œlow-endâ€ labels! 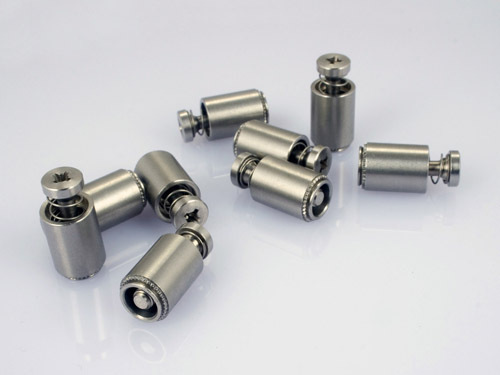 In the entire manufacturing industry chain, the fluctuation of raw material prices has nothing to do with non-influence of the downstream fastener industry, but it is not a solution. The future development of fasteners should fundamentally solve the problem, how to solve the transition of low-end products Capacity? How to grasp the procurement timing of raw materials to achieve low-cost production capacity? How to reduce production costs and save resources? These are problems that companies should face. Raw materials are "rising". Passive enterprises will be shuffled. To survive and develop, we must take the initiative to open up new paths and improve our internal strength to cope with market changes! Metal fasteners have always been dominated by iron and steel materials. Due to fierce market competition, quality and cost have become the main means of competition among fastener companies. Luo Baihui believes that there are two main ways to reduce costs: 1. To reduce the content of alloying elements or to use other low-cost alloy elements as reinforcement materials; 2. To reduce the manufacturing cost of fasteners, for example, to reduce the heat treatment process in the bolt production process. Non-modulated steel, free-cutting steel used to improve nut machining capability. The introduction of technology in the automotive industry in China has played a role in promoting the application of new materials for cold heading steel. Some of the major high-strength fasteners use foreign material standards. Luo Baihui believes that to achieve the goal of saving resources, accelerating the use of special steel for special bolts. R&D will be valued in the next 3-5 years. This is also the trend of tight enterprises in the situation of soaring raw material prices. For fastener manufacturers, all finished products are inseparable from large purchases of raw materials such as iron ore and wire rods. Raw material prices have been pushed too fast and too fast. This has made it difficult for downstream demand to follow suit. It may be difficult to significantly reverse the late price of ore. Avoiding fluctuations in raw material prices has a decisive effect on the procurement costs of fastening companies in China. Actively purchasing raw materials at relatively low prices, preparations for cost reduction in future batch production are required. Therefore, being able to focus on raw material price fluctuations and buying at low cost is also one of the conditions for the success of a business decision maker. We are professional manufacturer of Injection Moulding Machine from China,PET Injection Moulding Machine adopts special PET screw and barrel to suitable for PET material, this Pet Injection Molding Machine is sutiable for different area of miniral water ,costmetic, drinks,jar and so on.